Discussion in 'iPhone Accessories' started by 6thDAY, Oct 15, 2013. I just saw this today. .now I can replace my Fre. So I don't think Lifeproof made this, but may be part of the design. I'm curious to know what they come up with. ...was a half a$$ed attempt at humor, apparently. Does it have an integrated screen protector? Without one this is sadly a no-go for me. Looking at the third photo on their website yes. Doesn't cover the home button by the look of it. It's a waterproof case. Of course it has one. Also, you can see it on the site. Seriously. You should probably check out the lifeproof nuud before making such a comment. Maybe you should get informed before talking down to people. There's the well-known waterproof "nuud" series from Lifeproof, that does NOT have an integrated screen protector. And by the way, Lifeproof got bought by Otterbox. Also nowhere on the Otterbox Preserver for iPhone 5 site does is say anything about a screen protector, the word "screen" does not appear once. Now, please tell me again that the Preserver MUST have an integrated screen protector, JUST because it's a waterproof case. Seriously. Anyone know if the lifeproof 5 cases work with 5s flash/camera? If not will have to wait for this OB. Again the 3rd photo on their site with no phone in looks like it has a screen protector and a hole for the home button. Have a look. So there will be a 5 and 5s one? i would prefer the 5 for my 5s if the camera works. i dont use touch id. Looks like the opening for the flash is big enough on the iPhone 5 case. Should be the only possible incompatibility, unless Otterbox was overly precise in their home button implementation (shape and depth are a little different on the 5s). Since the iPhone 5 case is already in stock it won't be too long until we find out. I can't find the 5 case on their site. Are you saying its already for sale? Ok found it. I can't find the 5 case on their site. Are you saying its already for sale? Yep i found a couple of white/grey ones on ebay. Camera hole on back looks the same to me 5 or 5s? I don't want the home button exposed. How could i find out? The built-in screen protector guards the vibrant display from scratches without inhibiting touch sensitivity. Works well on my 5s however I really miss being able to unlock it with my thumb when I use it, hence the want for the OB Preserver. So, thankfully it has a built-in screen protector. Even though I'm not too happy about the plastic ring around the home button reaching into the screen area, now I'm intrigued..
To me, that is an unforgivable flaw. The pictures Do seem to show that the plastic ring around the touch is sensor extends into the screen area. 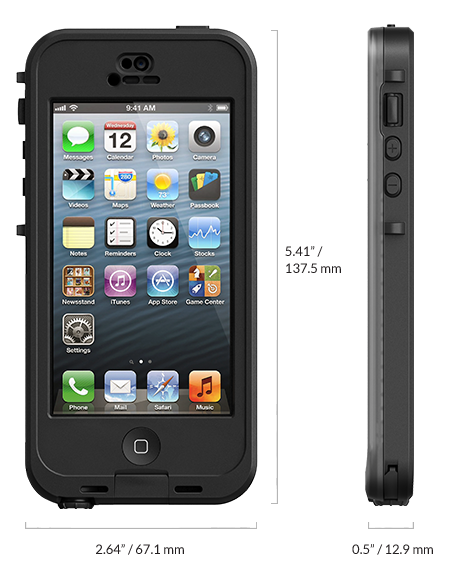 i'm really interested in this for the iphone 5.
looks like the bottom has the rubber port covers just like the otterbox armor which is so much more convenient than the screw-in adapter that the lifeproof uses. my lifeproof adapter makes my headphones constantly skip (seems like the connection comes in and out) when i'm walking or working out at the gym and it's driving me nuts. would really appreciate reviews/comments when someone finally gets their hands on one. thanks! Looks like only iphone5 version is open for purchase now, anyone had ordered one yet?